Every time I click on a website, and I do that dozens of times a day, I send a silent thank you to Sir Tim Berners-Lee. 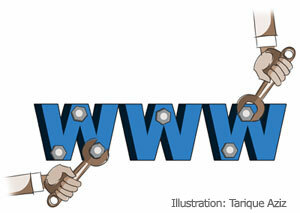 He was the scientist who created the World Wide Web and changed the world in a fundamental way. The way we operate, the way we communicate and the way we think because the web helps us to access so much more information than ever before in history. Don’t confuse the Internet with the web. The Internet predates the web but in 1991 Sir Tim created the World Wide Web which transformed what was mostly a system used by a few experts into something that became mainstream in a huge way. But he did not think it fit to patent his invention. As he explained, and it is a much-quoted quote, "The original idea of the web was that it should be a collaborative space where you can communicate through sharing information." Remember, there were quite a few hypertext systems at the time—all of them proprietary. Sir Tim’s web, on the other hand, was an open standard that helped it to become the primary tool, mainly because no one had to pay any royalties to implement the system. As the anti-patentees argue, we would still be struggling with a limited system if the core standards of the web had been patented. Instead, thanks to Sir Tim’s vision, we have a system that is truly worldwide because it can be adopted universally. As a result, we have the gift of the largest public repository of information and knowledge ever available to humanity and a powerful communications tool. Technology expert Mike Masnick says instead of the open "www", we would be limited to proprietary, walled sites such as AOL and Compuserve. And users would eventually have run afoul of patents since not many would be willing to pay the licensing fee. Masnick points out concepts like real time info would not be present or would be in their infancy. Worse, the ultimate terror of this generation, there would have been no Google. Imagine that! He also believes—another nightmare of the well-heeled consumers—that there would be no iPhone. Forestalling those who might beg to disagree, the tech pro says there wouldn’t be the same interest in developing smart phones without the web. All that might have emerged would have been limited proprietary phones “with a fragmented market and not as much value”. So while the corporate world sings paeans to Microsoft founder Bill Gates for his extraordinary philanthropy, one can speculate how much more Sir Tim might have made from his royalties and then, perhaps, become the world’s biggest donator of personal wealth. It is a fundamental difference in how one views the world. It is also interesting how Microsoft, which initially opposed patents, has become more aggressive in defending its patent right, both within and outside the legal system. In fact, an internal memo of the company in the 1980s warned of the dangers of intellectual property rights (IPRs) on software. “If people had understood how patents would be granted when most of today’s ideas were invented, and had taken out patents, the industry would be at a complete standstill today,” it said. So thank goodness for the likes of Sir Tim. Oddly enough, the founding fathers of the US, which preaches and practises aggressive IPRs, were a different breed. Benjamin Franklin and George Washington consistently refused patents on their many inventions, believing instead these should be freely available for the larger good of society. It was a tradition that would gradually die out but it is thanks to many other like-minded geniuses that we have FM radio, matches and lightning rods without IPRs. More on such worthies later. Why do we need patents?